Elof K Eriksson is a Doctor primarily located in Boston, MA. His specialties include Plastic Surgery. He speaks English. Elof K Eriksson has received 2 awards. The overall average patient rating of Elof K Eriksson is Great. Elof K Eriksson has been rated by 40 patients. From those 40 patients 14 of those left a comment along with their rating. The overall rating for Elof K Eriksson is 4.0 of 5.0 stars. Dr. Eriksson has been my plastic surgeon since l990 and has treated me many times with the utmost care and professionalism. I regard him as the Best of the Best. Dr. Elof Eriksson performed corrective surgery on me three summers in a row. As a result, my life is transformed, and I have a second chance. Dr. Eriksson is a miracle worker, with magic hands and a loving heart. I have no words for how amazing it is to be under his care. Dr. Elof Eriksson is literally the best in the world at what he does. I am blessed to have crossed paths with him. My life will never be the same, and at 72, I am inspired to make it count! So happy with my results of my full tummy tuck with breast lift and reduction. So happy with the experience. Very kind man with an outstanding bedside manner. Lovely person- but my rhinoplasty results were terrible. I regret not going to a surgeon who strictly specialized in facial plastic surgery. I've had severe pain, large lump, and disproportionate results that make my nose appear worse than pre-surgery. After seeing specialists I will need to have a revision rhinoplasty to correct multiple issues. i went with someone having experience and associated with reputed hospital . I choose Dr Eriksson as he is head of dept for plastic surgery at Brighmans and Women. As i had severe gynacomastia he did it in two surgery with span of 10 months. i had little to no pain after surgery. i have pretty good results and confidently go to pool without shirt on. Cost at Brigmans is also less than other reputed hospitals like Mass General. 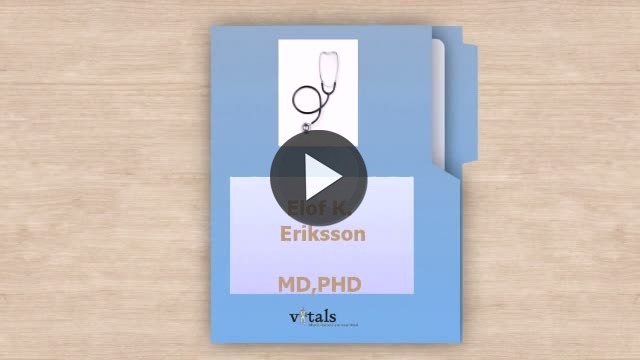 Take a minute to learn about Elof K Eriksson - Plastic Surgery in Boston, MA, in this video. Elof K Eriksson is similar to the following 4 Doctors near Boston, MA. Have you had a recent visit with Elof K Eriksson? Select a star to let us know how it was.